Next Step For Drones May Be 'Automated Killing' : The Two-Way The Washington Post reports researchers are developing drones that some day could "search for a human target and then make an identification based on facial-recognition or other software." Then, "a drone could launch a missile to kill the target. A U.S. 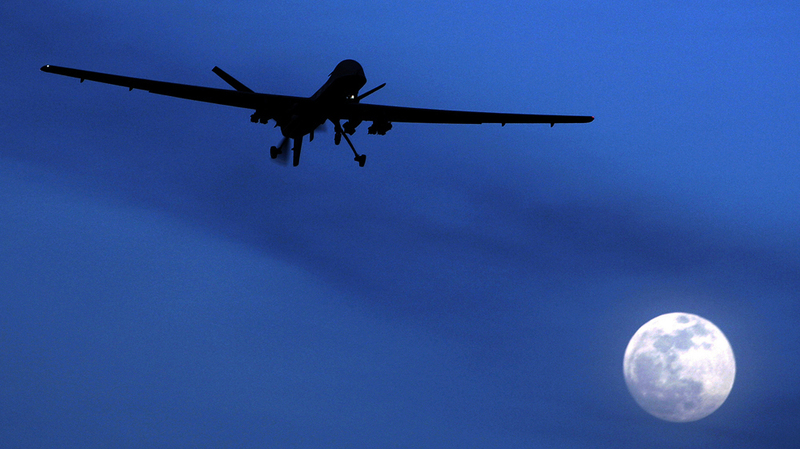 Predator drone above southern Afghanistan in January 2010. "A day when drones hunt, identify and kill the enemy based on calculations made by software, not decisions made by humans. Imagine aerial 'Terminators,' minus beefcake and time travel." According to the Post, the groundwork has been laid "for scientific advances that would allow drones to search for a human target and then make an identification based on facial-recognition or other software. Once a match was made, a drone could launch a missile to kill the target." Of course, at some point a human would have to decide what information the drones would be given — presumably, for instance, the data to be used to identify the individuals it might target. But as the Post adds, "the prospect of machines able to perceive, reason and act in unscripted environments presents a challenge to the current understanding of international humanitarian law." How soon might such technology be available? "One or two decades, or longer," the Post says.